Washington, D.C. | www.adc.org | December 5, 2018- ADC denounces in the strongest terms all efforts to criminalize the right to free speech. We are alarmed by the growing number of assaults against the freedom of speech for those who advocate for Palestinian rights and equality. This week alone, we take note of the growing number of attacks against those who speak up for Palestinian human rights. Particularly alarming are attacks on student rights as well as attempts to pass national legislation that will criminalize boycotts for Palestinian rights. ADC is committed to protecting your civil rights and remains unwavering against all efforts that violate the First Amendment. 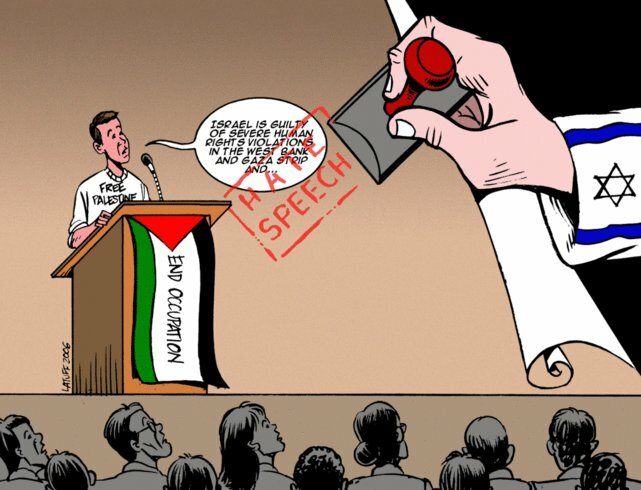 On college campuses, students are facing extraordinary assaults on their first amendment rights, particularly when advocating for Palestinian rights. ADC joined Palestine Legal with a coalition of national civil and human rights organizations to send a joint letter to Kenneth L. Marcus, Trump’s Assistant Secretary for Civil Rights at the U.S. Department of Education (DOE), calling for an immediate end to his assault on free speech on college campuses. Secretary Marcus is once again proposing to redefine anti-Semitism to include speech that criticizes Israel. It is a clear violation of students’ constitutional rights to penalize them for speaking about Israel’s occupation of Palestine and the daily violations committed against the Palestinian people. The DOE has an obligation to protect the constitutional rights of students. Public universities are a space intended to cultivate healthy discussions and critical thinking about international issues, such as human rights abuses. Student organizations are on the front lines leading work to protect civil and human rights across the board. It is the duty of the DOE to uphold and protect the right to freedom of speech on college campuses not to violate it.